Application or app tape is also known as transfer tape or premask tape. Transfer tape, also known as application tape or “pre-mask”, is a staple of digital graphics. Application tape is so called because it transfers your vinyl graphics and decals after you’ve cut them on your vinyl cutter. After the decal has been cut and weeded, it has to be transferred to a substrate. Some vinyls like 6mil Chalkboard or printable wall vinyl, can be transferred by hand. But for most vinyl graphics jobs, transfer tape is essential. 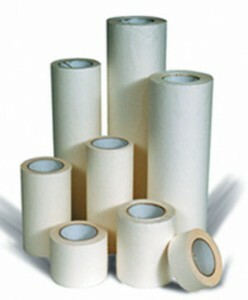 There are a variety of types of application tape. SignWarehouse stocks 19 different lines of application tape for indoor, outdoor, digital print, and heat transfer applications. 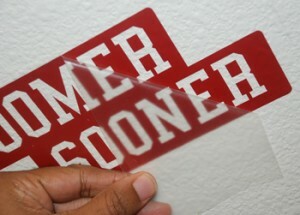 One of the bumps in the vinyl graphics learning curve is figuring out what tape to use for your particular job. This beginner’s guide to application tape aims to shorten the curve by answering these important questions. What’s the difference between paper and clear tape? What’s the best tape for indoor graphics? How do I choose the best tape for my workflow? Maybe you’re at the very bottom of the curve and your first question is; what is transfer tape and what do I do with it? For the answers to these and other questions, read on. Application tape is like a bridge. It connects your vinyl graphics to their final destination: the substrate. (The substrate is what you want to put your letters on; such as a window, car door, corplastic sign blank, etc.) Once you’ve cut and weeded your graphics, they’re still lying there on the release liner, full of promise, yet somehow incomplete. A yawning chasm exists between them and the undecorated substrate that awaits. Whether your graphics need to get to Banner Heights, Coroplast Corners, or Magnetic Manilla, they can’t make the journey without transfer tape. The tape is then laid down in a smooth flat covering over the cut and weeded letters. Pressure is applied with a squeegee to activate the tape’s adhesive. Then, as the tape is pulled away, it brings the vinyl along for the ride, transferring your letters and graphics to a happy productive life in Aluminum Acres. There are two different kinds of transfer tapes; paper tape and clear or transparent tape. For most applications either one will suffice so it’s largely a matter of personal preference. But there are essential differences that should be taken into account when choosing one or the other. Here’s a quick comparison. Paper Pros & cons. As is name implies, paper tape is composed of a paper based face film coated with adhesive. It’s essentially industrial strength masking tape. Like masking tape, it’s generally somewhat translucent, but not transparent. It tends to be softer and more flexible than clear tape. Its primary advantage is the wide range of tack levels. Paper tape can be purchased in low, medium, or high tack variants. It also tends to be less expensive than clear tape. The other major advantage of paper tape is the porous nature of the face film. This makes it ideal for use with application fluids like RapidTac or SureGlide. Users who want to expand the margin of error when applying the pre-masked letters to the substrate can add a light coating of application fluid that lubricates the substrate, retarding the adhesive of the tape and vinyl just enough to allow them to move it into position. This wet application process can trap fluid under the tape. With paper tape, this isn’t a problem because pressure can force the fluid through the tape’s face film so it can be wiped away with a paper towel. The main virtue of paper tape is its versatility. There isn’t one tape that will work for everything, but a good quality paper tape in medium and high tack variants could probably cover most of your needs. So why use clear tape? Because there are a few things paper tape doesn’t do quite as well. Because of its paper face film, it’s not as useful for building multi-colored vinyl graphics that require precise registration of one layer upon another. Even for single color graphics, it can be hard to see exactly where the vinyl is going to end up. And if you’re selling DIY graphics that your customer will install him or herself, the paper pre-mask dilutes the visual appeal of your product. The need for more transparency or better presentation quality leads many people to choose clear tape. Clear tapes are so transparent because they’re made from plastic face films instead of paper. The clear plastic construction provides the transparency some sign makers need. As noted above, it also makes the pre-masked image more appealing for DIY customers because the underlying vinyl design is clearly visible. This clarity of the vinyl also makes installation easier because the installer can see exactly where the letters will be in relation to the substrate or other design elements. (Fig 2) Given these advantages, why doesn’t everyone use clear tape for every job? Why isn’t every bridge a drawbridge? Because every solution has its drawbacks. The plastic face film that makes clear tape so appealing also makes it a bit less practical and versatile. It doesn’t work as well for wet applications because the fluid can’t pass through the face film. So if you use too much, it can get trapped under the tape and begin to degrade the adhesive of the vinyl and of the tape itself, leading to delamination of the vinyl from the plastic face film. Clear tape can be used with wet application, but it must be done more carefully. Click here for more details on making this work. Clear tapes also tend to have lower tack adhesives and are therefore not as effective in transferring certain kinds of vinyls. Some vinyls require a more aggressive adhesive to remove them from the release liner. Most clear tapes are not well suited for these vinyls. Another drawback to clear tapes is static. The plastic face film tends to generate a static charge, especially in arid environments. This can attract dust and debris, which makes clean bubble-free transfers more difficult. The final limitation of clear tape involves limited versatility. Unlike paper tape, clear tapes made for vinyl graphics cannot be used for heat press T-shirt transfers. The plastic face film tends to melt at the temperatures required for successful thermal transfers. There are heat resistant clear tapes used for T-shirt transfers, but they’re special products not well suited to standard vinyl graphics applications. Click here for more information about transfer tape for T shirt graphics. Medium Tack or High Tack Application Tape? Try to match the tack level of the tape with the properties of the vinyl and substrates you’re using. There are three factors to consider; the adhesive bond between the tape and the vinyl, the bond between the tape and the substrate and the bond between the vinyl and the substrate. Ideally, the bond between the tape and vinyl should be stronger than that between the vinyl and the Kraft paper release liner. If not, the tape won’t pull the vinyl off the liner. ORACAL 641and 651 are stiffer films that require higher tack tapes to get them off the liner. For more about why this is so, please click here. For these vinyls, we recommend EnduraMASK high tack, which was formulated specifically for use with ORACAL calendared films, or EnduraMASK MHT 130, which is a medium-high tack paper tape. Applying vinyl graphics to rough or porous surfaces poses quite a challenge because these substrates form weaker bonds with the adhesives on the tape and vinyl. This is usually not a problem in the sign industry, but is fairly common for installers decorating interior walls with “knockdown” textured surfaces. The challenge here is to find a tape with enough tack to remove a matte surface vinyl from its liner-which is not easy- but not so much tack that it pulls the vinyl off the wall when the tape is removed. Our new EnduraMASK MHT 130 medium-high tack paper tape excels in these applications. It works well with EnduraMATTE and ORACAL 631. Please click here for more information about this exciting new product. Once you’ve decided to use paper or clear tape, and determined the right tack level for your vinyl graphics, you will have narrowed the field somewhat. Here are a few other attributes to consider. 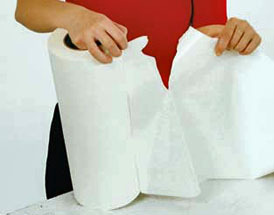 Tear quality: Tape is generally used in sections, torn off by the installer. Low quality tape tears unevenly in useless, ragged little pieces. Good quality tape tears cleanly and predictably so you can pull off the size you want in one attempt. On good quality paper tapes, the adhesive tears with the paper face film. Lower quality products have adhesive coats that resist tearing producing strings of adhesive like melted pizza. Besides being a nuisance, this stringing can make an uneven adhesive bond with the vinyl and degrade performance. Wrinkling and edge lift: The most aggravating aspect of low quality paper tape is wrinkling. If your tape wrinkles as you’re applying it to the vinyl, that wrinkle can transfer to the vinyl graphic and ruin it. Proper application technique helps, but opting for a higher quality paper tape makes this work-stopping problem much less frequent. R-Tape Conform and enduraMASK Perfect Tear Layflat tapes are excellent at reducing wrinkles during application. In addition to reducing wrinkles, R-Tape’s RLA and Main Tape’s “Plus” feature enhance layflat performance, meaning the tape is less likely to curl away from the vinyl once it’s applied. This benefit is primarily for those selling pre-masked vinyl graphics to be installed by the end user or a third party. Standard paper tapes will begin to curl away from the vinyl after a few hours. If your “DIY” customer comes in to pick up their decal and the edges of the tape are peeling upward with two days of collected dirt on them, it makes your product look cheap and grungy. An application tape with superior layflat properties preserves your professional quality presentation. This feature is also found on our EnduraMASK Perfect Tear Layflat. Air egress: Most experienced installers are aware of the benefits air egress liners bring to vehicle wraps and printed sign applications. You probably didn’t know there’s a transfer tape that has a similar feature. R-Tape AT75 Clear Choice has an embossed face film that creates a grid pattern of air-egress micro-tunnels in the adhesive layer. When the tape is applied to the vinyl, bubbles can be pushed out just as air pockets are removed by air egress liners on premium wrap vinyls. Static: As noted above, one of the more notorious downsides of clear tape is static. The smooth plastic surface of the face film can easily generate a static charge as the tape is unwound. The problem is partly related to the relative humidity of your work environment so if you’re in Orlando, Florida you may be scratching your head. People in Denver and Arizona however, are quite familiar with it. One of the other benefits of the embossed liner on the R-Tape AT75 Clear Choice is the reduction of static. Because the face film isn’t as smooth as normal clear tapes, less friction is generated and therefore, less static electricity. What if you prefer the smoother, clearer AT60, but don’t want the static? Here’s a tip from industry application expert, Jim Hingst. You can reduce static by unrolling the tape more slowly, or by spraying the top of the face film with a very light mist of RapidTAC. Whatever your digital graphics application, it’s a good bet you’ll need transfer tape at some point to bridge the gap from design to installation. Consider your choice of vinyl and substrates and choose the best tape for your particular challenge. You’ll probably find that, as your business grows, you’ll need to stock a few different kinds of tapes for indoor and outdoor graphics or for use with different kinds of vinyls. Choosing the best tape for the job can smooth out the various wrinkles in the vinyl graphics process. Keep plenty of it on hand.